The 29-year-old suspect is not believed to be known to MI5 or counter-terrorism police, and is not co-operating with officers. Searches are taking place in Birmingham and Nottingham. Two people were treated in hospital for their injuries but discharged. 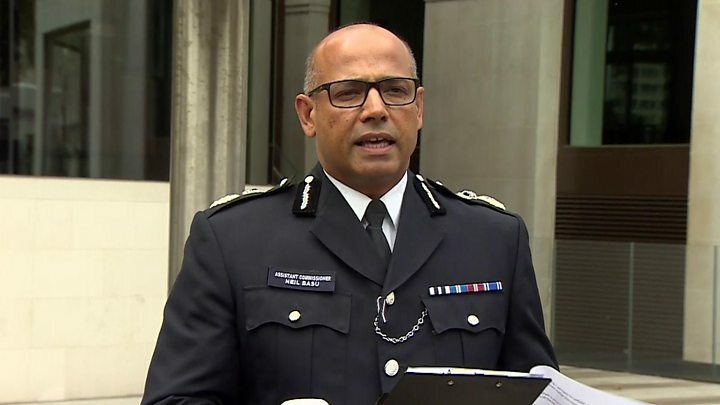 Scotland Yard's head of counter terrorism Assistant Commissioner Neil Basu said: "Given that this appears to be a deliberate act, the method and this being an iconic site, we are treating it as a terrorist incident." He added there was "no intelligence at this time of further danger" to London or the UK as a whole. The government held a meeting of its Cobra emergency committee and the prime minister has paid tribute to the "formidable courage" and professionalism of the emergency services who "ran towards a dangerous situation in order to protect the public". Urging the public to remain vigilant but "carry on as normal", Theresa May added: "For the second time in as many years the home of our democracy, which is a potent symbol of our precious values of tolerance and freedom, has witnessed terrible scenes just yards from its door." Sources say he is from the Birmingham area. 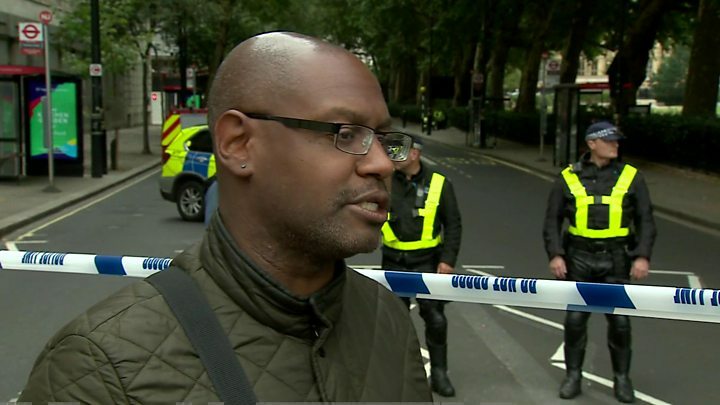 Security Minister Ben Wallace told the BBC the suspect was British but originally from another country. Westminster Tube station was closed for entry and exit, and streets around Millbank and Parliament Square cordoned off for several hours after the crash. The immediate area around the incident remains taped off and screened by white temporary fencing. A man and a woman were taken to hospital and later discharged, while a third person with minor injuries was assessed at the scene. Media captionWitness: "I saw a man drive towards Parliament at speed"
"The car went on to the wrong side of the road to where cyclists were waiting at lights and ploughed into them. "Then it swerved back across the road and accelerated as fast as possible, and hit the barrier at full pelt. "He hit it at such speed the car actually lifted off the ground and bounced. Another witness, called Kirsty, said: "A car drove the wrong way round the road, drove through about 20 cyclists and crashed." Jason Williams told BBC Radio 4's Today programme the driver had "driven at speed - more than 40 mph". Ewalina Ochab, who also saw the crash, said: "I think it looked intentional - the car drove at speed and towards the barriers." She said: "I was walking on the other side of the road. I heard some noise and someone screamed. I turned around and I saw a silver car driving very fast close to the railings, maybe even on the pavement." 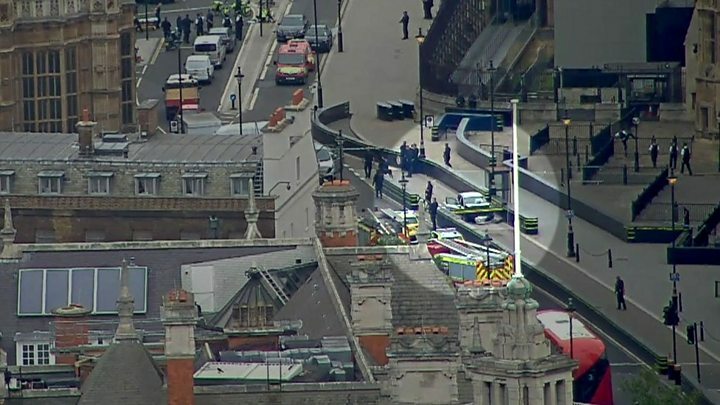 More than 10 police vehicles and at least three ambulances were at the scene outside Parliament - where firearms officers and police sniffer dogs searched the area. Security arrangements at Parliament have progressively tightened since 2001. In the aftermath of the 7/7 attacks, new truck bomb-proof barriers were installed in an effort to "target harden" Westminster. Visitors need to go through a chicane-like system designed to help armed officers spot suspects. The one significant weak spot was the main vehicle gates - as became apparent in March 2017's one-man attack. 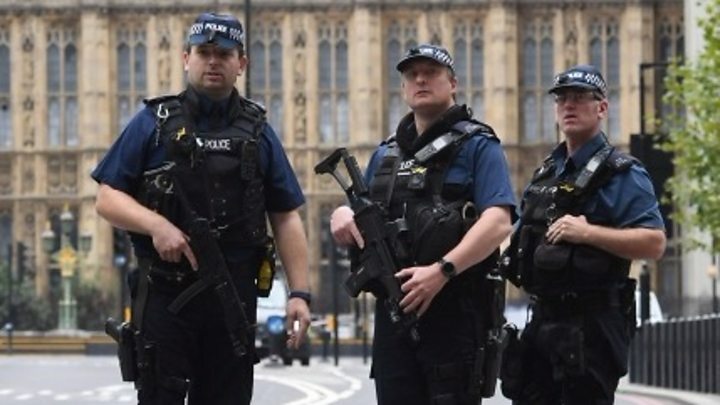 That triggered an internal security review that has led to changes that remain secret - although it's apparent to Londoners that there are now more armed police than ever before patrolling the area. The threat of terrorism is a constant concern for Parliamentarians - it's not new. The IRA murdered Airey Neave MP in 1979 in a car bomb that exploded within the palace grounds. And the dilemma remains the same: how best to balance security with guaranteeing that the heart of British democracy remains open to the people. Home Secretary Sajid Javid expressed his gratitude to the emergency services. Mayor of London Sadiq Khan said he was in close contact with police and that he "utterly condemns all acts of terrorism on our city". And Labour leader Jeremy Corbyn said the bravery of emergency services "keeps us safe day in, day out". US President Donald Trump responded to the incident on Twitter, saying: "Another terrorist attack in London... These animals are crazy and must be dealt with through toughness and strength!" The Prime Minister's Official Spokesman said as of the end June 2018 there were 676 live investigations into potential terrorist plots. Scotland Yard is asking anyone with information on Tuesday's crash to call 0800 789 321. Anyone with video or pictures of the crash is asked to send them to police.